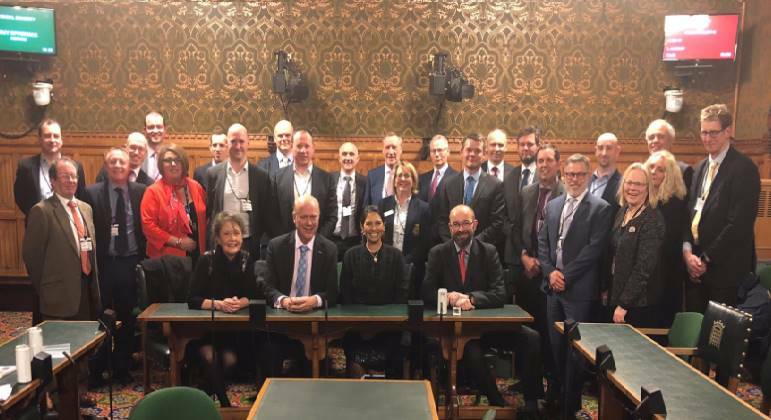 Witham MP, Priti Patel, chaired a meeting of the Essex Chambers of Commerce Business, Transport and Infrastructure Forum on Monday evening with the Secretary of State for Transport, Chris Grayling MP, as guest speaker [4 February 2019]. The meeting was well attended by a number of Essex businesses and the Transport Secretary provided an update on the transport investment taking place in Essex at present. The meeting was also an opportunity for Priti and local businesses to press the Transport Secretary on future investment and transport priorities in Essex, including improvements to the A12 and A120 and rail investment on the Great Eastern Main Line and West Anglia route. “I was delighted to welcome the Transport Secretary to our meeting of the Essex Business, Transport and Infrastructure Forum and I am grateful to him for outlining the progress of the current transport projects taking place across our great County. “Investment in our transport infrastructure is the key to unlocking the full potential of our County by helping businesses compete in a growing economy and in global markets. Given Essex’s strategic location, with ports and airports, our businesses are keen to lead the way in establishing future trade and export opportunities.